For over 30 years, Pipeline Products has been providing quality ‘Made in USA’ tools and custom fabrication services to the water and wastewater industries. We manufacture the industry’s finest off-the-shelf tools and custom fabricated products to meet your specific needs. We are the leader in innovative solutions, like our lightweight, yet durable, polyethylene Advantage Series Air Release & Vacuum Valve Enclosures, as well as our leading edge Vandalguard Valve Stem Protector designed to protect the brass stems on backflows from theft. Our years of experience in the waterworks industry, coupled with our commitment to responsive customer service, as well as the production of durable goods, gives you the peace of mind knowing that your products are made right the first time, and delivered to you as promised. Whether you need our off-the-shelf tools or custom fabricated items, look to Pipeline Products to provide you the very best in quality and attentive service at a competitive price. Call us anytime for answers to your technical questions and know our team of experienced waterworks tool designers and fabricators is here for you. Ray Higley founded Pipeline Products, Inc. in 1980. Prior to that, Ray had been providing wet tapping and pipe welding services for decades and during that time, he had fabricated a variety of different hand tools for local water districts. At Pipeline Products, he used his experience, craftsmanship and creativity to design many new and innovative tools and products. As an avid drag car fabricator and driver, he also demanded only the highest quality products and workmanship. Pipeline Products, Inc. continues to be a leader in both new product development and quality. 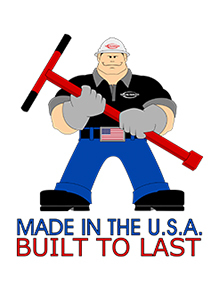 Other companies may copy our products but they cannot copy our history of providing the highest quality waterworks tools that are MADE IN THE U.S.A. and BUILT TO LAST.